Was I supposed to lay down this vintage 75 cl bottle for a few years before drinking it? I think maybe I should have. Well, it lasted a couple months anyway. I guess I opened this bottle because I wanted to see how this apparently higher-brow brew compared to Chimay Blue. The only problem is, I had the Chimay Blue so long ago -- it was the first official beer of the 40b40 all those years ago -- and I’m not sure I can make a proper comparison. Actually, that’s been a problem a number of times. I need to do some side-by-side tastings of similar styles and brands. And the Chimay Blue tasting was a bit spoiled by the beer being served too cold, almost frozen, in fact. It almost turned me off Chimay Blue and Red. I’ll get back to them someday. Anyway, on to the Grande Réserve... it’s a dark beer, and the taste is initially raisins and dates. Grilled dates, if that makes any sense. Maybe golden syrup as well. Then at the end, it has a port wine flavour. 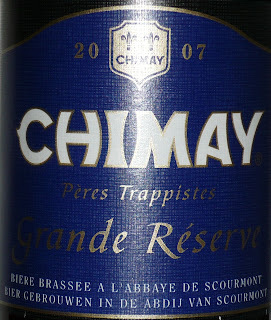 It’s thinner than some of the richer dark beers, such as Wesvleteren 8, but I find Chimay Grande Réserve a bit too fizzy. I felt I had to swirl the glass a bit to lower the bubble level. I wonder how it would have tasted if I’d waited a few years. I’ll have to buy another bottle of the 2007 Chimay Grande Réserve and see if I can be more patient next time.